We guarantee your complete satisfaction for your first shirt order. Whatever the reason, we will take care of all alterations to the first shirt that you order, so that you are ensured of a perfect fit. These alterations will also be applied to the pattern used for your initial order, so that they are reflected in any future orders placed. Alterations will only be made to the measurements of the finished shirt. This does not apply to options such as fabric, collar, or cuffs. It does not apply to simplified measurements (standard sizes). How to exercise your warranty? 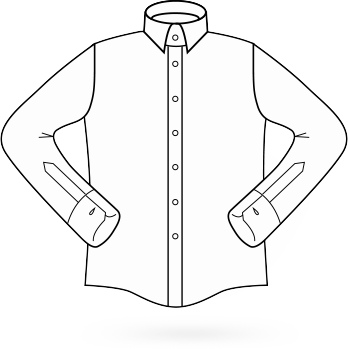 You will only be liable to pay the postage and packing charges for returning the shirt to us, except in the case of orders delivered outside French territory, in which case the customer will also be responsible for meeting postage and packing charges following completion of the alterations. In the event that your first order contains multiple shirts, we will initially prepare only a single item in order to ensure that you are fully satisfied. Once you have confirmed your measurements, we will commence production of the remainder of your order.